We have a new Poll Dorset ram, George, who will be injecting fresh blood into the flock. He is very calm and at present has Charlie for company while Abraham is otherwise engaged with his half of the flock. 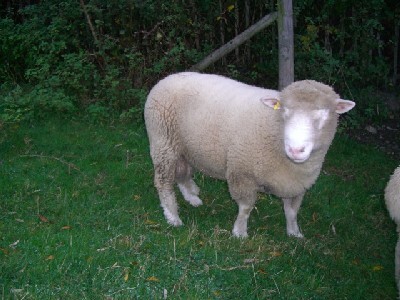 George is a shearling and was born in February 2006. George went to visit his ladies throughout March & April 2008 so his first lambs were born in August 2008. He then visited Florence & Helen in the autumn as they didn't produce any lambs in August (they were first timers) and both those ewes then produced twins in April. Unfortunately (or fortunately, depending on your viewpoint!) despite being ewe lambs, they will all hop in the freezer eventually as they would be too inbred if we put them back to either George (their father) or Abraham (their grandfather). George has been kept busy in 2009 as he spent some time at the beginning of the year with Fiona, Colleen, Caroline, Amaryllis, Bluebell & Elderflower.